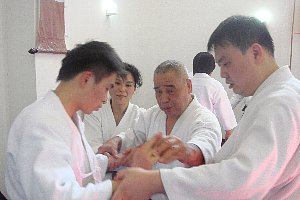 During this last long weekend break I went to Beijing for the first time, in order to have practice with the people of the Sheishinkan (Zheng Xin Guan) Dojo, one of the dojos in China that is affiliated to Aikido Kobayashi Dojo. This year is the Shanghai Expo, and last year the Olympic Games, so China has been all over the news recently. This was my first visit to China and I enjoyed the trip. We arrived on April 30th. The Beijing airport is much wider than Narita, and with a higher ceiling, leaving me with the impression of a vast space. 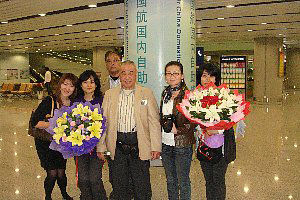 We were welcomed at the airport by He ZhenJiang, the head instructor of Sheishinkan, and members of the dojo. As we walked out into the parking lot we heard the sound of honking horns. Beijing people use the horn at the slightest incident. The road had been widened at the time of the Beijing Motor Show, but although it was an expressway, all sorts of vehicles were using it: rickshaws, motorcycles, bikes, people walking, and cars were going left, right, straight ahead, and making U-turns. The sound of honking was overpowering. From that evening, horse drawn carts were to become forbidden to use the road, so they were out in such great numbers that even the Beijing people were surprised. It was ‘anything goes’. The place where we stayed was where the Beijing Olympics were held (Bird’s Nest). We could see in front of us the Beijing Go Shu Grand Plaza. Our rooms were huge with great, wide double beds and furniture too big for our frames. I just laid splayed out on the bed like a giant chainese character for ‘big’ (dai). May 1st is China’s May day celebrations, with everyone getting a three day holiday. After breakfast we went sightseeing to Tiananmen square, the Forbidden City, and the great Wall. We didn’t see many tourists, but all the sights were swarming with domestic visitors. It was like Shinjuku Station at rush hour. I was thankful for all the security forces looking over the crowd. 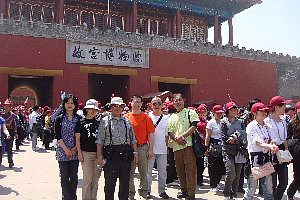 It was a sightseeing experience where we could truly get a sense of China’s history. After lunch we gave a seminar in a dojo that aikido shared with kung fu. It was about 80 mats in size and about 60 people attended. The Sheishinkan has five dojos in Beijing, and branches in Xi'an, Henan, Guangzhou and Inner Mongolia. 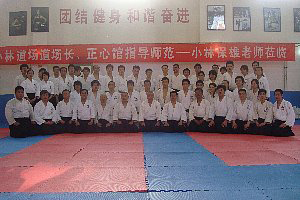 It is China’s biggest budo organisation. 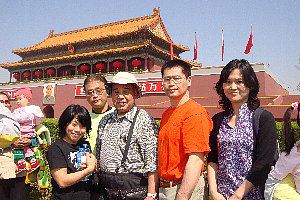 Furusawa shihan of Suzhou Kobayashi Aikido Club and his deshi came from Suzhou to join us. It took 8 hours by train to come to Beijing. They told me that Suzhou will have one more dojo soon. There were people who had come by train from as far away as Xi'an, taking them eight hours. It really brought home to us just how vast China is. Among the group from Xi'an was a sixteen year old girl who was passionate about aikido. Most of the participants in the seminar were students of Sheishinkan, but there was also Suzhou’s Furusawa shihan, and a Japanese, Mr. Hotta, a shodan, members of a dojo affiliated with Hombu dojo, students from a branch of Kyushu’s Suganuma shihan, and Azabu dojo’s Takano Shihan’s deshi. In addition, there was a woman from Brasil, who practices in the dojo where the shihan was Kobayashi Dojo’s first uchideshi, Shikanai shihan; and a Portuguese woman who attended many of Hiroaki sensei’s seminars in Oslo, Norway. Looking at all of these, we could truly feel how far aikido has reached in the world and that we all can share no matter what our nationalities or our dojo affiliations.